From above, NGV Australian looks like a handful of dropped lego bricks. The gallery is not a sombre white box but instead a dynamic curious space worthy of the art it displays. It features hard-flooring, no ramps or inclines, and plenty of rest areas. Tick, tick and tick. The Australian offshoot of the NGV International, on St Kilda Road, it opened in 2002, in the newly minted Federation Square, relieving the NGV of a plethora of works. Here you can find perennial favourites like Tom Robert’s Shearing the Rams and John Brack’s Collins Street 5pm along with some lesser famous – but sometimes more challenging – artworks. We arrive at the NGV Australia early, finding a wide-eyed school group and more staff than visitors. More people arrived before lunch and into the afternoon. An older couple walked, hands clasped behind their backs, while kids giggled and did precarious pirouettes. At the concrete and timber reception desk, we find helpful staff and a cloak room. Opposite this are the ground-floor toilets (including an accessible toilet) and the Design Store gift shop. A ‘floating’ staff member can answer most questions about the space and the exhibits. On the lower floors, you can take in Indigenous art, working your way up you’ll find the work gets more and more recent. 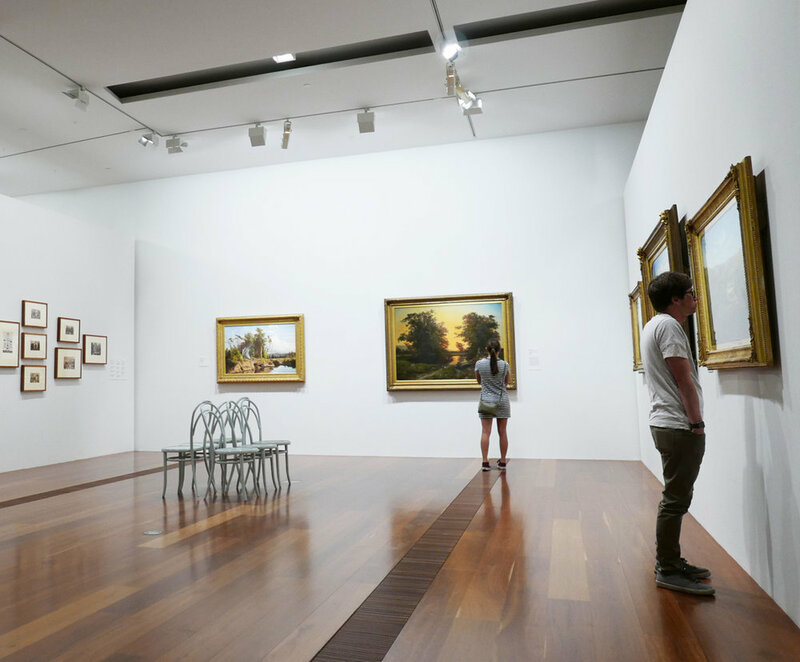 Level 2 is the home of 19th and 20th-century Australian work, and moves quickly from early painting to modern work, from landscapes to the post-modern art. Curators play with pace and contrast. Here, a sparse white wall with one or two pieces, there, a cluster of 50 paintings wrapped around a corner. Walls painted light or dark also change the mood. It’s surprising and dynamic if very condensed. The top floor — the temporary galleries — are edgier. On our visit, a collection of contemporary Australian work showcases video and mixed-media and has visitors whispering questions and observations. As author Cesar A. Cruz said, ‘good art should comfort the disturbed and disturb the comfortable’. Crossbar Café is also on the top floor and fine for a tea or coffee, but the food seems overpriced, and Fed Square has plenty of better alternatives. Accessible toilets are to the right of the goods lift on level 2 and 3. On the ground floor they’re opposite the Design Store (gift shop). Hidden somewhere in Melbourne, is an NGV warehouse crammed with art they can’t fit in the galleries. For Australian art you can check out, NGV Australia is easy to get around and get to. Not so: Australian Art could use a larger secondary showcase further out – an NGV Megaplex.